No space in enclosures at all? AN-M-DV Micro type video & data over fiber converter is there to solve your space constraints. Dimensions are just 82.8 mm x 72.8mm x 30.5 mm! fully assembled using SMT components for stability and reliability. 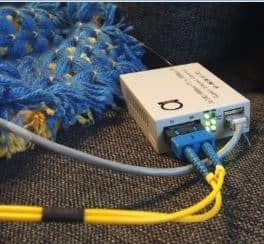 Micro sized video signal & data serial port over fiber transmitter & receiver, distances from 20 km and more. The AN-M-V1D1-S1T/R series is designed using advanced ASIC and high-speed DSP technologies. The AN-M-V1D1-S1T/R series video to fiber converter employs multiplexing and de-multiplexing techniques to transmit and receive 1 channel video, 1 channel reverse RS485 data over an optical fiber in all digital signaling with no compression; making it ideal for applications where input signal integrity and quality must be maintained and no loss should be induced. Because the AN-M-V1D1-S1T/R series utilizes all-digital, non-compression technology, it is able to transmit signals without distortion; whereas the analog technology inherently noisy, low quality, long term instability and susceptible to electromagnetically and environmental interference. 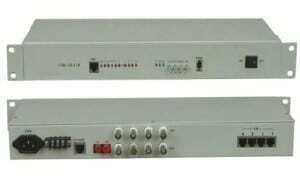 The AN-M-V1D1-S1T/R series accepts a variety of video inputs, such as analog or digital video recorder, DVD/VCD, digital camera, CCTV and any 8MHz video signal. PAL, NTSC and SECAM standards are supported. The AN-M-V1D1-S1T/R series supports standard RS485 pan-tilt-zoom control signaling. Plug-and-Play design ensures ease of installation and no electrical or optical adjustment is required. LED indicators are provided for showing operating status.The AN-M-V1D1-S1T/R series is fully assembled using SMT components for stability and reliability.